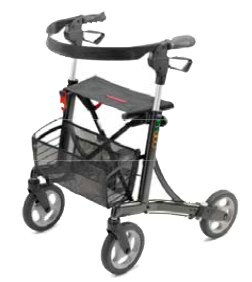 The new Invacare FR300 Rollator features an easy to fold frame, it collapses sideways. Basket and seat are made of fabric to allow folding sideways. The FR300 fits users 5'2" up to 6' in height, has a weight capacity of 285-lbs and walker weighs only 17.5-lbs. The new Invacare FR300 rollator combines a high-end, streamlined look with the clinical benefits associated with walking more inside the rollator frame. 8" wheels provide a smooth ride over uneven surfaces. Locking-Loop brakes are easy to use. Curb Climber located on rear wheel.